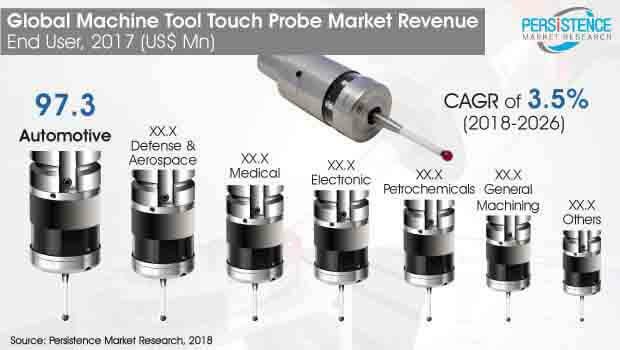 " Machine Tool Touch Probe Market by Probe Type - 3D Touch Probes, 2D Spindle Probes, Tool-Length Measuring Probes, Tool Touch-off Probes; by Transmission - Infrared, Radio, Hard Wired; by Machine Type - CNC Machining Center, CNC Turning Center, Others; by End Use - Automotive, Defense & Aerospace, Electronic, General Machining, Medical, Petrochemical, Others "
Machine tool touch probes are used to precisely measure the dimensions of a work piece and are connected with sensors that allow them to be safely operated within the industry space. Rise in safety leads to reduced cost and operational downtime, which is expected to increase the productivity of many operations. Thereby, this particular facet will significantly raise the demand for machine tool touch probes in the market during the forecast period. Machine tool touch probes can operate in conditions in which humans cannot sustain themselves or in conditions in which humans cannot operate optimally, such as when accuracy is the primary factor. As a result of this factor, machine tool touch probes have been in high demand in the manufacturing industry and will remain as such in the coming years. The global market for machine tool touch probe provides a healthy competitive platform for companies operating in the market as well as for the new entrants trying to venture into this sector. The burgeoning use of advanced technology at the time of the production of machine tools has further increased its attractiveness among end consumers and several other vertical industries. The verification of the quality of the parts of the machine is a challenge that comes up often during the manufacturing process. Machine tool touch probe is one such equipment that allows the easy verification of the quality of the machine parts and helps measure the dimension of work pieces more accurately. This can help players in the automotive industry overcome critical challenges pertaining to the quality and safety of the manufactured automotive parts. A touch probe offers enhanced features such as robustness, reliability, size, and accuracy and also provides all the advantages of an automated job setup and the ability to measure 3D parts on all machining centers. This will help the automotive industry make sure that they adhere to the safety standards and ensure that the parts that are integrated in the cars are verified. Chemical processing, machining, electronics, construction, and automotive industries, among others are expected to provide lucrative growth opportunities for the manufacturers of machine tool touch probe. The market is expected to perform well in emerging economies as they are driving industrialization and construction globally. Machine tool touch probes find extensive application in the automotive industry as well as in the manufacturing industry as these tools are employed for measuring the dimensions of components accurately. The burgeoning automotive industry output is anticipated to be one of the most noteworthy drivers for the global machine tool touch probe market. The production of automobiles is expected to be comparatively high in developing regions as compared to developed economies. This can be primarily credited to the growing urbanization and steady economic conditions in these regions.